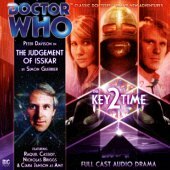 Appearances: "The Judgement of Isskar" to "The Chaos Pool"
History: Amy stands as unique among The Doctor’s companions in that, when she initially joined The Doctor, it was to request for him to act as her companion, rather than the other way around. A sentient Tracer created by the Grace - powerful entities outside of time- to find three segments of the Key to Time - the reasoning being that this would prevent one person being tempted by the full power of the Key - Amy - initially unnamed - came to The Doctor to seek his assistance in acquiring the three segments, recognising that The Doctor’s practical experience would be of benefit to her even if the Grace felt that The Doctor’s personality made him dangerous and unpredictable. Freezing time on the planet where The Doctor was currently located to make contact with him- the Fifth Doctor was currently travelling with Peri, but the Grace froze time after The Doctor and Peri became separated, thus leaving Peri totally unaware of The Doctor’s meeting with Amy - Amy claimed the first segment of the Key - disguised as a compass-like device The Doctor had salvaged from a crashed ship- and subsequently accompanied The Doctor into the TARDIS. Initially a naive, essentially bland woman, Amy began to develop her own personality as time went on; a casual comment of The Doctor’s prompted her to recognise that it ‘tickled’ when she sensed the segments and transformed them into their natural states, subsequently expressing awe at the warmth of Mars at their next location. Like Romana, Amy was initially dissatisfied with the name The Doctor chose for her - The Doctor initially mistook her reaction to her first new planet as a response to the name ‘Amy’, having been going through a list of names to try and find one she liked, subsequently sticking with that name after an encounter with an Ice Warrior required him to make introductions - but grew into it over time. The most defining element of Amy’s personality was her discovery of the conflict that had developed between her and her ‘sister’ Zara, another sentient Tracer created to find the other three segments, named by The Doctor when Amy insisted that her ‘sister’ have a name as well. While Zara - whose initial human ‘contact’ was with a thief called Harmonious 14 Zinc - grew to desire the power of the complete Key and sought it all for herself, Amy, inspired by The Doctor’s advice that one couldn’t be a benevolent dictator, rejected the Key’s power, only using her ability to access the segments when no other choice was available to her. When her sister Zara acquired the fourth segment - transforming it into its natural state despite the fact that it was disguised as a castle that still had people inside - Amy, despite being alone and less experienced than Zara, rejected her sister’s offer on an alliance and restored the segment to its form of a castle to save The Doctor and its inhabitants, demonstrating her essentially pure nature. 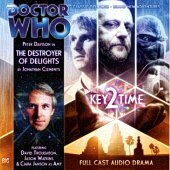 Amy’s true independence was demonstrated during a trip to ninth-century Sudan, where she and The Doctor were separated after being cut off from the TARDIS and forced to rely on The Black Guardian to send them to find the next segment of the Key. Although mistaken for a slave in the court of Lord Cassim, Amy nevertheless managed to cope well with her new situation, swiftly identifying Lord Cassim as a currently-weakened Black Guardian and subsequently learning of his alliance with an alien being as he attempted to leave Earth. Reunited with The Doctor, the two of them swiftly tracked down the disguise assumed by the fifth segment - which had, paradoxically enough, actually been created by The Black Guardian’s plans - subsequently departing to track down the last segment. In the final struggle to acquire the sixth segment of the Key - revealed to now be The Doctor’s old companion Romana, who had ‘inherited’ the essence of the sixth segment after the restoration of Princess Astra to human form and Romana’s subsequent regeneration - Amy and Zara came together at last, Zara recognising that she was more than just her sister’s ‘counterpart’; like Amy, she too had a choice to make her own choices, and she had become too human now to remain permanently her sister’s opposite. Using their ability to shift the segments to escape the armies of The Black Guardian and The White Guardian - Amy restoring one segment to its original form as a castle to give them somewhere to hide while Zara turned another into a lake to help them escape capture - the two Tracers worked together to keep the segments out of the hands of others. 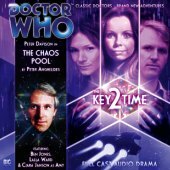 Even when faced with the Grace themselves, now personified in the Key to Time, Amy and Zara both rejected the Grace’s orders to give the Key to them, instead handing the Key over to The Doctor and allowing him to destroy the Key in the Chaos Pool where it had been forged. As Zara left for Atrios, having fallen in love with a captain from that planet, Amy decided to accompany Romana back to Gallifrey, Romana deciding that the Time Lords needed to admit non-Gallifreyians to their ranks and feeling that Amy would make a good candidate as the first such ‘recruit’. Whether The Doctor and Amy shall ever meet again remains to be seen; however, given the Time War mentioned in the new series, it seems likely that Amy herself is now deceased. Although she met The Doctor in the first four minutes of her existence, Amy went on to develop a surprising strength of character in her time with him, quickly standing up to her ‘sister’ Zara and performing the unprecedented feat of converting a segment of the Key to Time back to its previous disguise when Zara turned the segment back to its natural state even when it was a castle that was currently inhabited by The Doctor and several other people.